Here’s the thing: I love the Rifts RPG. This is not to say that it doesn’t have flaws—it has many—and it is not to say that I love every product in the line (I don’t). But overall, Rifts as an RPG setting is, IMHO, both very original and awesomely inspiring. There are tons of cool ideas in the Rifts universe, tons of interesting characters to meet and places to explore and bad guys to defeat. In many ways, it is a GM’s wonderland. Literally anything from anywhere can show up in Rifts, and that’s just fine. I know for a fact that hundreds of Rifts players have brought in the Robotech universe characters and mecha into Rifts Earth. Ditto for superheroes from Heroes Unlimited. There’s even books out there just to convert your favorite character from other Palladium games into a Rifts character. There’s so much awesome in Rifts that sometimes it overshadows the deep and abiding flaws that exist within the line. The system is a kludgy mess that is 25 years old—a creaky, D&D-inspired class and level-based system that causes most gamers I know to roll their eyes and sigh. It’s what we, as gamers, put up with in order to play Rifts… not something we really enjoy. Just to be clear, this is not to say that the system is terrible—there are certainly games out there that are worse, and in many ways, Rifts is still a /functional/ game system. You can play the game with it. However, I believe this game is simply begging for an update. Some of the writing is… not-so-inspiring. For one example, Rifts Australia is basically all-Mad Max, all the time. I could call out some other books here, but I’m trying to abide by my ground rules of “No hate,” so I’m just basically touching on the issue without getting too far into the details. 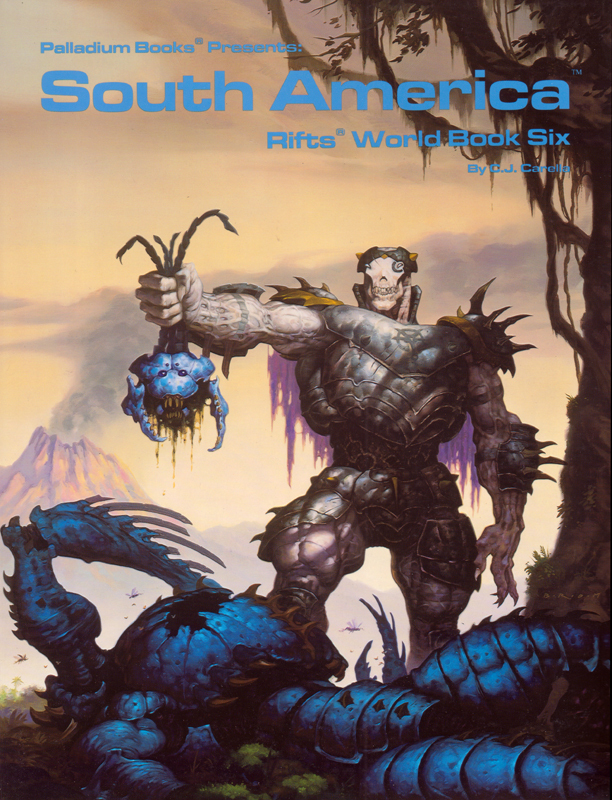 Rifts fans have had a long ride with this setting—it’s been in print for over 25 years and while there have been some missteps along the way, the line as a whole is quite an achievement for any gaming company to be proud of. Thanks to Palladium’s early entry into the RPG market, they have a lot of fans out there, and it’s likely that you can walk into nearly any RPG store or club and find someone that either currently plays Rifts or has played it in the past. The purpose of today’s post is to talk about the books that really made me love the Rifts setting. The cream of the crop from a line of over 80 books (and still growing). The Dyna-max robot. When you absolutely, positively have to kill every Gargoyle in a 1-mile radius. Accept no substitutes! I must admit that I am a fanboy of giant robots fighting stuff. Here are just a few examples: I love Robotech and Battletech. I enjoy many flavors of Gundam. Front Mission 4 is one of my favorite console games. 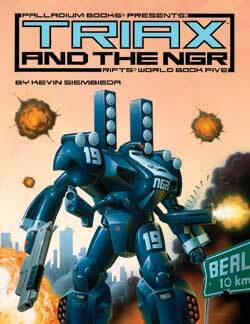 Thus it should be no surprise that Triax and the NGR is on my list of favorite Rifts books. Triax includes quite a few nuggets of greatness for people like myself. Tons of power armor, guns, robots, tanks, more giant robots, epic-giant robots, giant tanks, and much more. The Kevin Long artwork really sells this book for me, and there’s a great little comic in the center of the book to help detail just what’s going on in the NGR. The bad guys of the setting are also pretty interesting—giant gargoyles who use magic and their innate cunning to dominate much of western Europe. Additionally, we get introduced to other iconic Rifts bad guys like the Gene-Splicers and the Brodkil Empire. Some interesting notes; Triax and the NGR was my amongst my first exposure to some sci-fi concepts like “telepresence” robots operated by remote, infiltrator robots and cyborgs like the Terminator, and much more. 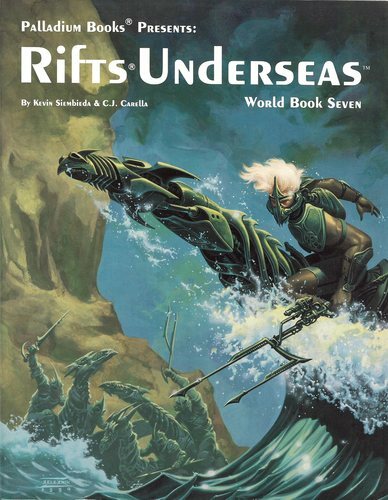 It’s important to note that additional material for Triax can be found in the Mindwerks sourcebook, Underseas (presented on this list), and in a sequel product, Triax 2. Apparently I’m not the only one who loves the idea of giant robots fighting for humanity’s survival in the dark forests of Germany! Best things about this book: I want to pilot a Jaeger robot against the Gargoyles and reclaim Germany for the NGR. I want to explore the Black Forest (or fly above it in my Dragonfly robot). The Coalition. Are we the baddies? The Coalition is a humanocentric government that dominates much of North America in Rifts Earth. They are a significant force in the IP and the Coalition’s ongoing campaign of military conquest is a major story factor in the overall plotline of Rifts. 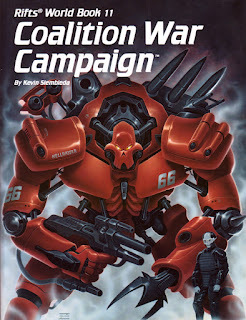 The Coalition War Machine sourcebook was the first in-depth look at the Coalition, and it helped cement their place as one of the most iconic and central ideas of the Rifts IP. Much like the Imperial Sourcebook for the Star Wars (West End Games D6 version) RPG helped flesh out who and what the Galactic Empire was all about, Coalition War Campaign goes into great detail discussing the Coalition, its leaders, and especially its military forces. The Coalition’s place in Rifts is somewhat controversial. On the one hand, they’re a brutal dictatorship led by some truly evil individuals. On the other hand, they are the de facto saviors of much of humanity (and much of human culture, including many common values) and are, in many ways, the best hope for humanity to thrive and prosper upon Rifts Earth. This ambiguity is sometimes good (in that any GM can basically choose how he wishes to portray the Coalition in his game) and sometimes bad (such as the metaplot for the conquest of Tolkeen, where the Coalition was painted in a very unambiguously cruel light). Coalition War Campaign provides a ton of player options (as is usual for a good Rifts product), including new classes, guns, power armor, mecha and vehicles. There’s also some interesting playable alien races—which is truly a bizarre place to find them—provided in a later chapter. This book is good because it brings out a lot more information about the Coalition and their place in the Rifts universe—and I should point out that the following books are also important to understanding to Coalition: Free Quebec, Lone Star, and the Siege on Tolkeen series. Best things about this book: I want to play a bunch of classes from this book, and I’d love to play in a game where the internal strife of the Coalition’s values vs. the personal agenda of its leaders was a core and central theme. 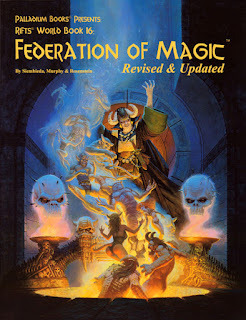 Cover by Keith Parkinson. Yet another very talented artist who doesn’t do work for Palladium anymore. One of the first things I need to say about this book is that Ramon Perez’s artwork transforms this product from good to great. Perez’s talent is apparent and it’s fair to say that along with Kevin Long he has shaped a significant portion of what the Rifts IP looks like. In my opinion, nowhere is this more evident than in Federation of Magic. The writing here is also good; Peter Murphy (in his only Rifts work that I can find to date—someone let me know if he did anything else) and Kevin Siembeida created some fantastic setting material. The concept of “fadetowns” that drift in and out of contact with Rifts Earth is especially cool, and the city of Dweomer and its mysterious Lords of Magic is detailed very well. The true Federation and the City of Brass have some excellent Rifts bad guys, and we also get some smaller setting areas like Magestar and the techno-wizard playground of Stormspire. The fairly bland magic automatons of Dweomer are probably the least interesting part of the book, but this is made up for in spades by the great character options, gear, and spells presented. Federation of Magic has a good mix of crunch to its setting material, a ratio that tends to vary wildly amongst other Rifts books. Best things about this book: I want to play a Battle Magus. I want to meet the Lords of Magic and change Dweomer for the better. I want to fight Alister Dunscon in his throne room. I want to visit Magestar and Stormspire and some fadetowns! Wormwood is the first of two “Dimension books” on this list, and I think they add a lot to Rifts as a line even if they are basically presenting a way to play the game that completely ignores the core setting. 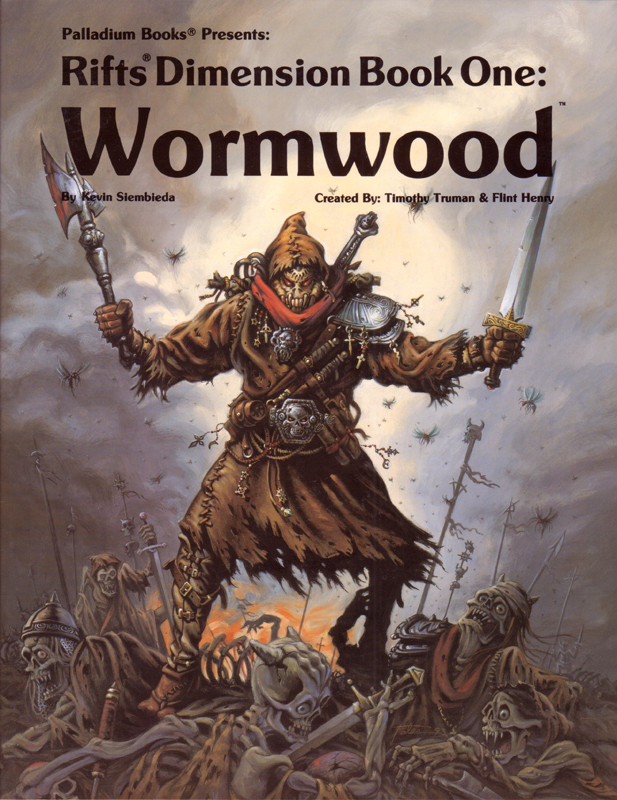 If Rifts Earth is Greyhawk, Wormwood is Dark Sun. Wormwood has a unique, unabashedly 80’s metal aesthetic that is truly distinct. It’s a setting where light and dark are engaged in a holy war across a living world. Hospitaller knights on motorcycles, symbiotes, and magic that calls upon the world itself to harm enemies or heal the sick are all part of what makes Wormwood special. The only drawback I can really see is that Wormwood is so specialized and so alien that it doesn’t really plug into the other parts of Rifts nearly as well as many of the other books in the line. Wormwood is definitely worth a read, and the writing and artwork of Timothy Truman brings this awe-inspiring and unusual world to life. Best things about this book: I want to play an Apok. I want to storm a crawling tower and fight my way to the demon lord at its apex. I want to join the Knights Hospitaller and defend the faithful on a pilgrimage across the worm wastes. 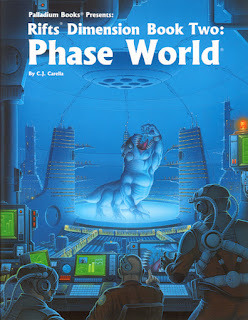 The brainchild of CJ Carella, Phase World is a sci-fi setting that is fairly distinct from Rifts Earth. In short, it is full of win and awesome. Now, to be clear, I always pair this book in my head with the Phase World Sourcebook that was released later, as the two together like peanut butter and chocolate into a delicious fusion of sci-fi goodness. This is the second “Dimension book” on the list. If Rifts Earth is Greyhawk, Phase World is essentially the Forgotten Realms. 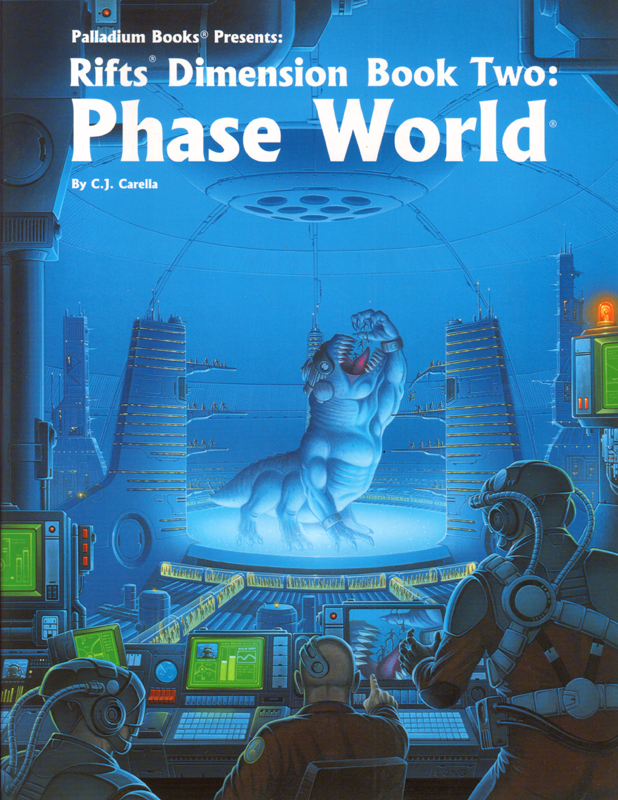 Phase world is a kitchen-sink setting (even /more/ kitchen-sink than Rifts, which is impressive) that combines high technology, aliens, galactic empires, psychic powers and spaceships with magic, gods, demons, and dimensional travel. For starters. I could go on and on. It’s just damn good. Best things about these books: I want to play an Invincible Guardsman, a Cosmo-knight, a Repo-Bot, a Quatoria. I want to confront the powers that be on Center, discover the mystery of phase shifting, and travel to the Cosmic Forge. No doubt one thing that you may notice from reading this list is that I’m a big fan of CJ Carella’s work on Rifts. Underseas is one of his earlier efforts, and it is a rich book that is full of cool ideas and concepts. Right of the top, what does Rifts Underseas give you? We get some cool information on the Bermuda triangle, time flux, and ley line storms at sea. We get introduced to the Lord of the Deep, a lovecraftian monster at the bottom of the ocean (well, actually, /all/ oceans!). We find out about the floating city of Tritonia, and we get tons of information on the New Navy—the remnants of the old US Navy who survived the coming of the rifts. Plus, demon pirates, more support for Atlantis (which is also on this list) with cool underwater mecha and power armor, and more support for Triax and the NGR (which is also on this list) with information about the NGR Navy. The artwork by Vince Martin and Kevin Long do a lot to really sell this book’s style and ambience, firmly establishing this product as part of the Rifts line. Vince Martin’s pieces in particular are well-suited to the subject matter. While much of this book is really cool and engaging—heck, I’d go so far as to say /most/ of the book is this way—there’s a part which talks about intelligent cetaceans and includes rules for playing as a dolphin or killer whale. Including power armor for such characters. Maybe I’m just traumatized by the Johnny Mnemonic film, but the idea of smart cetaceans getting really involved in my Awesome Rifts Adventures ™ just doesn’t really grab me at all, and I do believe it is the least interesting portion of the book. By contrast the stuff about the New Navy is just amazing, from their proud history to the unusual ways in which they have managed not only to survive but to keep the traditions of their service alive and well. Best things about this book: I want to play a Sea Titan. I want to help the New Navy find a home. I want to visit Tritonia and fight Atlantean Kittani raiders underwater and Horune pirates on the seven seas. I want to explore the Rifts Earth Bermuda Triangle and come out alive. AKA Drug-crazed maniacs rebel! What? You were surprised at this? Few books have as many cool ideas packed into one place as Juicer Uprising. 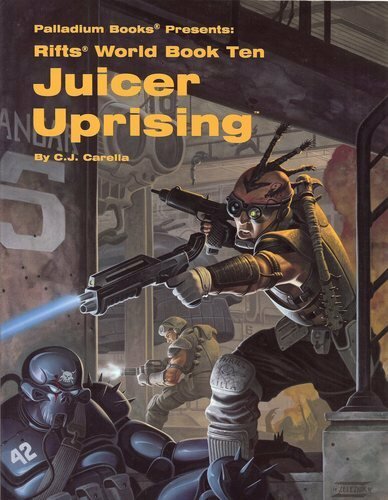 Yet another great Rifts book by CJ Carella (I did tell you that I’d be mentioning his name several times on this list), Juicer Uprising focuses on a particular character class from the core Rifts book known as the Juicer. These warriors are surgically enhanced with a set of combat drugs and an injector that circulates these powerful substances through the body. Consequently, Juicers are incredibly fast, strong, and tough, ranking amongst the most dangerous men-at-arms in Rifts Earth. However, this enhancement has a cost—Juicers live only a handful of years after undergoing the process, leading to a “burn bright and burn out” lifestyle. Juicer Uprising takes a much closer look at this concept and provides a great storyline to go along with it—first, the city of Kingsdale is introduced. Basically, Kingsdale is a place you can get nearly anything. Someone is claiming to have found a way to keep Juicers from dying. In fact, however, the Juicers are being brought back as undead known as Murder-wraiths! On top of all this, the book contains a Juicer sport known as Murderthon, a variety of different kinds of Juicers you can use for your character (including the awesome Dragon-juicer, who uses the blood of dragons rather than drugs to fuel his system). Naturally, this book contains quite a bit of new gear and toys (like rocket-boots! ), and goes over Kingsdale and the environs nearby in detail. I like to hold up Juicer Uprising as possibly the best example of a Rifts sourcebook. It’s nearly over-the-top, gonzo, and full of great ideas to get things moving for your Rifts campaign. Best things about this book: I want to play a Dragon Juicer and fight in the murderthon at Kingsdale. I want to tangle with a group of Murder-wraiths and learn the limits of my own mortality when my Juicer upgrade starts to wear off. I want to burn bright rather than fade away! Slaves welcome. Another Keith Parkinson cover, by the way. 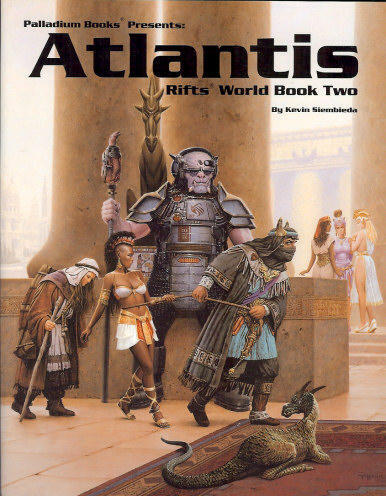 Definitely, I believe that Atlantis was one of the sourcebooks that cemented Rifts’ place in the RPG market. Atlantis was simply unlike anything else at the time, and still contains a number of unique features that sets it apart. Rifts Atlantis details the Atlantean race and the history of their continent–thought lost forever—that has recently returned through the rifts. It turns out that this once-great civilization has been conquered by the vile alien Splugorth and their slave races, forming a concentrated pocket of alien aggression right off the coast of North America. Atlantis is a really interesting setting, combining some features of decadent Rome with influences of Lovecraft and Conan. The Splugorth have their Kydian powermasters, their blind Altaran warrior-women, bio-borgs, and magically tattoo’d slave gladiators—just to name a few of the strange and unusual creatures you’ll find within. The artwork by Newton Ewell helps lend a very alien feel to the book, and although it includes a lot of familiar tropes (such as unbreakable swords, evil slaving overlords, and intelligent apes) it feels very fresh and new even decades later. Atlantis is a place where normal humans are definitely not welcome, and it serves as the stronghold for one of the setting’s greatest villains. The types of characters you can make who are from Atlantis are like nothing I’ve ever seen before, and they are all bizarre and powerful entities on Rifts Earth. The machinations of Atlantis resonate through many of the other books in the Rifts line, including two books on this list: Mercenaries and Underseas. Atlantis is one of those books that never fails to inspire some kind of neat idea when paging through it, and I think its uniqueness alone serves as a worthy mark of distinction. Best things about this book: I’d love to play a Kydian powerlord, an Altaran warrior-woman, a Hawk-ohrl gladiator, a bio-borg or Maxi-man. I’d like to wield a greater Atlantean runesword, battle Sunaj assassins and Kittani warmasters, and lead a revolt against Splynncryth, the ruler of Atlantis. 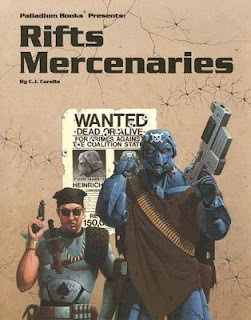 Rifts Mercenaries is one of my favorite RPG books, period. 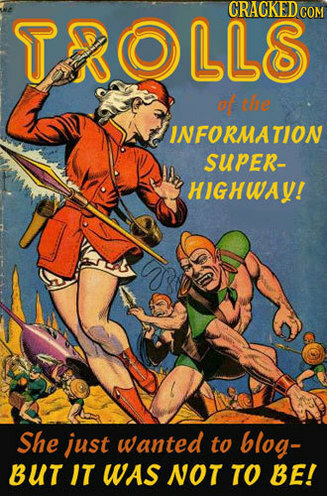 It’s a nifty book that includes an interesting organizational generator, a “character sheet” if you will for your own mercenary organization—an innovation that was definitely ahead of its time. Naturally, the book includes a lot of cool new classes, player options, guns, gear, power armor and vehicles—but all of this is still welcome, particularly as much of these options are versatile and common in many adventuring groups. The book also showcases half a dozen existing mercenary organizations, all of which are interesting. One of the best parts, for me, is how the various merc groups show off how you can put together a truly varied player character party—for example, a pixie, a cyber-knight, a dragon hatchling and a full conversion cyborg teaming up with a master psychic and a witch. For the full experience, I highly recommend picking up the Merctown supplement as well, which is an in-depth look at a really neat setting for Rifts; the city of Merctown. A bunch of cool adventures and adventure hooks are included in the book. There’s also another tie-in product named MercOps that provides even more adventure support. Basically, you can’t go wrong playing Rifts if you decide to make your group a bunch of wandering Mercenaries. I actually wonder if this wasn’t one of the primary themes that Kevin had in mind when developing the setting from the start! Best things about this book: More information on the Naruni. Chipwell armaments! I want to play a Merc Headhunter and form my own mercenary team to take down a Pecos bandit lord and carve out my own little piece of Rifts Earth! Two books full of pure awesome. I’m cheating a little bit by putting two books together in the top slot, but I don’t feel like you can have a meaningful discussion of one without the other. Hands down, I believe that these two books are the two best Rifts supplements out there. I never fail to find something inspiring or another cool idea tucked away within these tomes. These books have multidimensional mercenaries, stealth cyborgs, alien invaders, techno-wizardry, bizarre animal mutants, cities of gold, Incan gods… and that’s just for starters. CJ Carella really outdid himself on these two books. He’s gotten some flack from Kevin Seimbeida about the rules from these books, but in my opinion, that’s an unfounded criticism—what is true is that CJ put in every cool idea he could think of and then went out and found some more. Comparing these two books to the other World Books is just unfair. It’s a crime how forgettable China and Africa are, for example, in comparison to South America 1 and 2. I challenge any Rifts fan to read these books and not find something interesting for their character or their game. Best part of these books: Tons of character ideas. Ultra-Crazies. 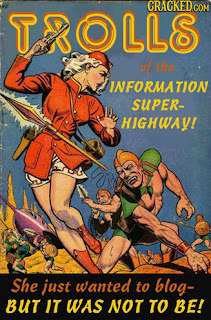 Amazons, Anti-Monsters, dinosaurs, a dragon and lizardman nation, vampires! I could run entire campaigns set in South America… and it would be awesome. Yay Rifts love! I also love the setting but hate the mechanics, but I’ve found some relief in porting some of the stuff to a mutants and masterminds game. The other games in the palladium megaverse range from awful to amazing, but rifts is an unending treasure trove of joy. When I read the title: “My Tragic Love Affair with Rifts” I new I was going to be able to relate! I’m always in for a top 10 list too, so thanks for that. I can’t agree enough, CJ Carella is the best thing that ever happened to Rifts. (Well I will give Kevin his credit for Rifts inception.) I think he really got me with his work in Pantheons of the Megaverse. So many good things in there!!! I also really loved the Siege on Tolkien books not just for the material and the great artwork, but actually more so for the storylne. The artwork of course really sells a lot of it too. Where would Rifts be today if not for the iconic work Parkinson did in that first book? 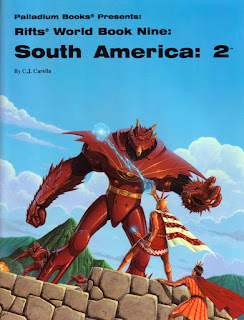 The cover, the red cyborgs hunting through the city wastes, the leyline walker. Perez was definitely one of the superstars, loved his deadboy special forces armor, much better than the cool sleek new deadboy armor that appeared in the Coalition War Machine book. Long really carried a lot of the books on his shoulders. I don’t think he is as good as some of the other artists, but he cranked out so much material, especially in the early days; same for Wayne Breaux. When they brought on a new artist to do a bunch of a particular book, that really helped to give the book it’s own flavor, such a Psyscape, for example. Perez came on board in a big way there, and Michael Dubisch’s unique work really gave the book it’s otherworldly feel! I’ve always hated the exhaustive rules and character stats! I hated some the sloppy artwork they sometimes resorted to, and the recycled artwork. Especially after Rifts had gained a following. I know some of the fans could have supplied better art if coaxed. The recycled art was the worst!!!!! There were some good examples, like the Enslaver rune weapon which is actually taken from a couple pages earlier in the Atlantis book where you see the Sword of Atlantis over a decorative shield. But how about the countless others like Inix being a edited Zembahk. Siembieda really needs to market this material better to other media. Let’s face it the D&D RPG would never have made Orcs as recognizable as the Warcraft games and Lord of the Rings films. For me the world contained within the pages of Rifts was infinitely bigger than the RPG. I didn’t continue buying the books to play them, a handful was good enough for that. I continued buying them to read them. I want to see someone like R. A. Salvatore come along and flesh out Rifts in novel form. I want to see a Skyrim or Destiny-like game based on Rifts. You could do Wormwood in one game, the Coalition vs Tolkien in another, Atlantis, or South America, or Phaseworld. They could connect in some way or remain mostly separate. I have to lay the blame for this a the feet or Siembieda. I know movie rights were optioned and that can lock away the potential for a movie if the studio then decides to sit on their hands, but I think a movie is premature anyway. Rifts needs to prove itself in most likely the video game realm first. (Does anyone really want to see a Rifts movie gone wrong?) I know a mobile Rifts game failed due to the poor reception of the new system it was set to launch on but, that appeared to have been to confining anyway. Palladium should aggressively pursue other mediums for this material. I know piracy is a big concern, but I would like to see a revised version done digitally. You could index the heck out of it, (lets face it, in book form this can be a nightmare) and update it was needed. I think a simplified rule system and a chance to flesh out some of the world books gone wrong would really interest a lot of new and old talent.